The playing area consists of the court and a safety space around it measuring 15 feet in each direction. 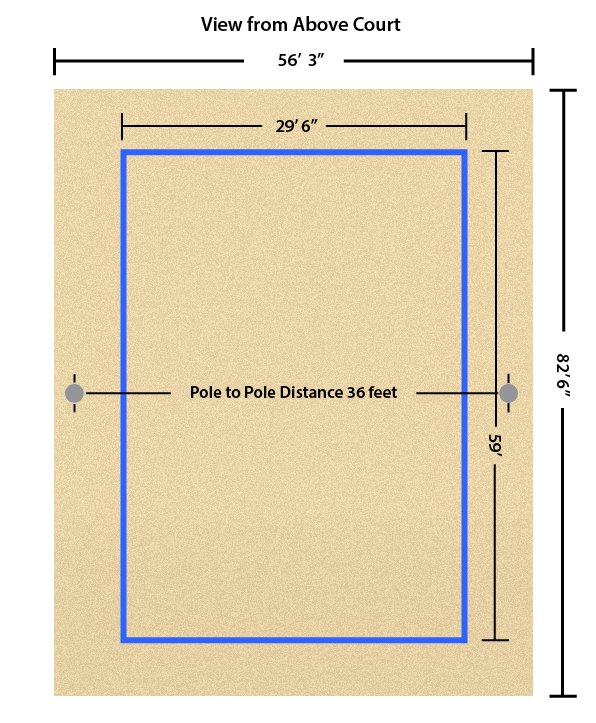 (56'3" x 82'6") (If you don't have this space, smaller courts can be built, call 1-800-494-3933 for recommendations). The space above the playing area should be free of obstructions. If trees are nearby that cannot be removed, we recommend using our Grate Sand Device to periodically clean the tree debris from the sand. 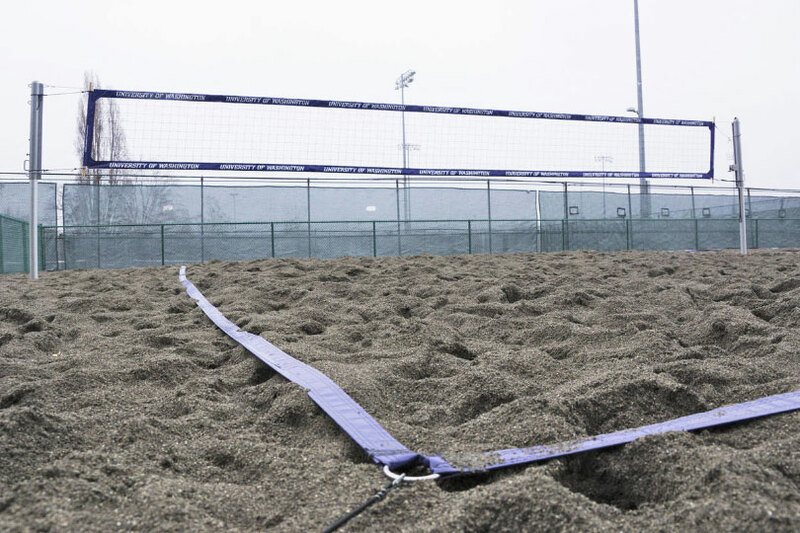 The playing area (52'6" feet by 26'3" feet - measured from the outer edge of the boundary lines) should be level and consist of good quality volleyball sand to a thickness of 18" within the boundary lines. This prevents players from contacting the underlying surface and a surrounding sand thickness of 12" to keep sand costs down. After determining the number of courts you plan to install, remember to orient the courts as close as possible so that they are running north-south. This orientation provides the best non-glare playing environment, ensuring one team isn't looking directly into a rising or setting sun during competition. With competition volleyball, it is common for volleyballs to be hit at unpredictable angles at times. Thus, the more space you have between the courts, the less often teams will have to re-play points when a ball from another court enters their court. A minimum distance of 20' is recommended between courts and a division made with court banners, netting or bleachers installed between the courts is even better. You will want to excavate the area per our "Lateral Drainage Configuration" on the right. If you are building in an area prone to flooding or with lots of standing water, you will want to increase your gravel travel layer from a standard 4" to a 12" depth. The gravel should be rounded such as pea gravel or river rock and provides rain water a quick path to the perforated PVC pipe which drains to area away from the courts. 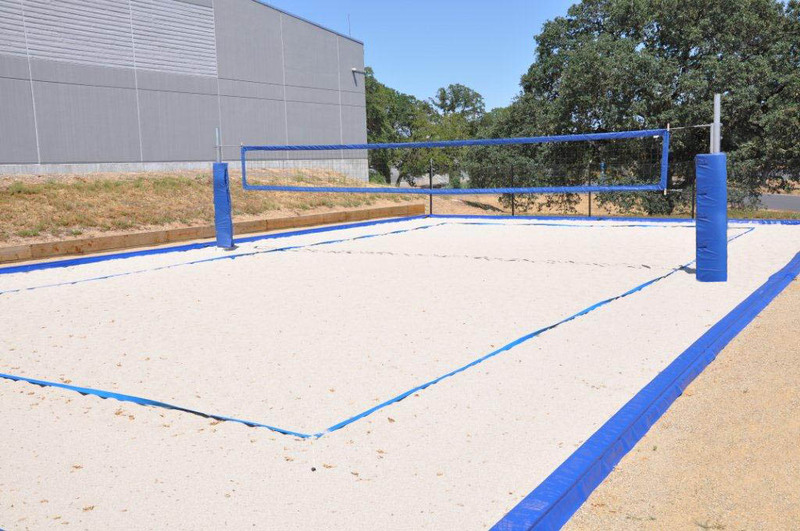 After the area has been excavated, you'll want to install our Sand Preservation Fabric® to insure that the good quality volleyball sand you've invested in doesn't wash away with rain fall. After excavation has been completed you will want to select an edging material. 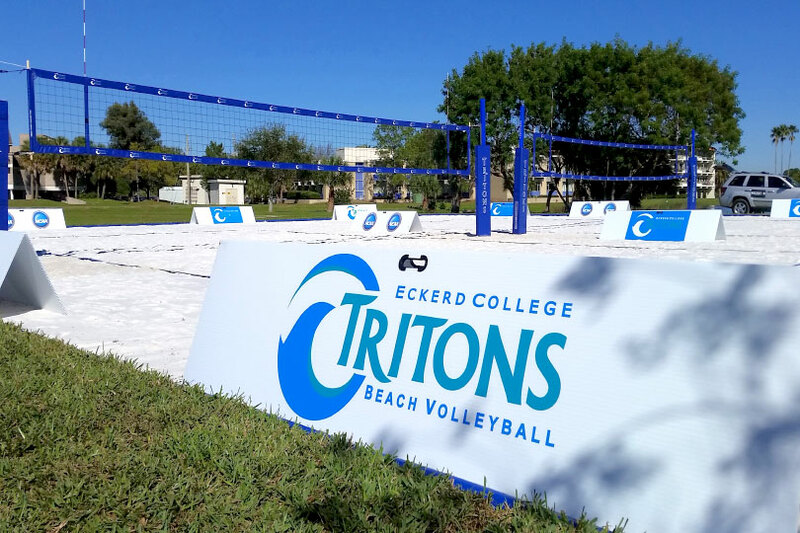 When it comes to collegiate volleyball with school reputations, coach reputations, scholarships and possibly future professional careers, the edge you select is very important from a safety point of view. Volleyball is a sport played in the air and a player chasing after a volleyball looking up in the air shouldn't have to worry about diving for a ball during a critical play and landing on a concrete, wood or other hard edges. 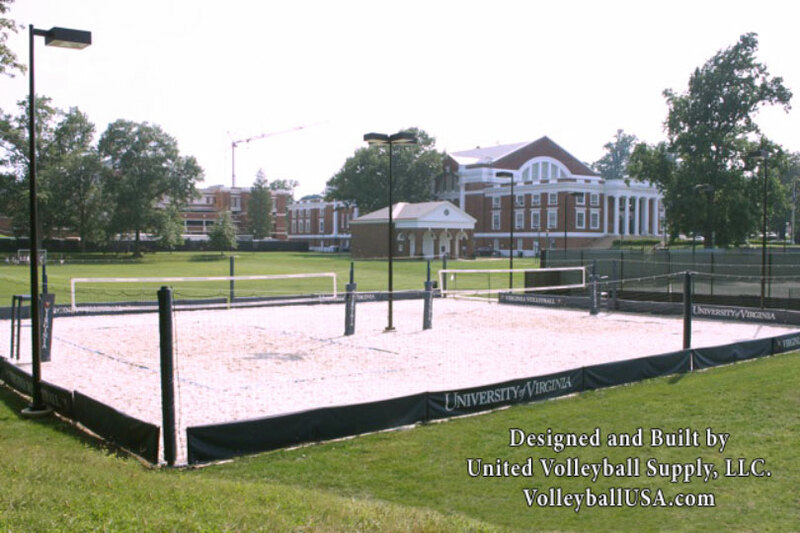 This is why we manufacture two products for the sport of beach volleyball, Edge Guard® and Curb Pad®. Both products provide a safety cushion to protect your players from injuries. 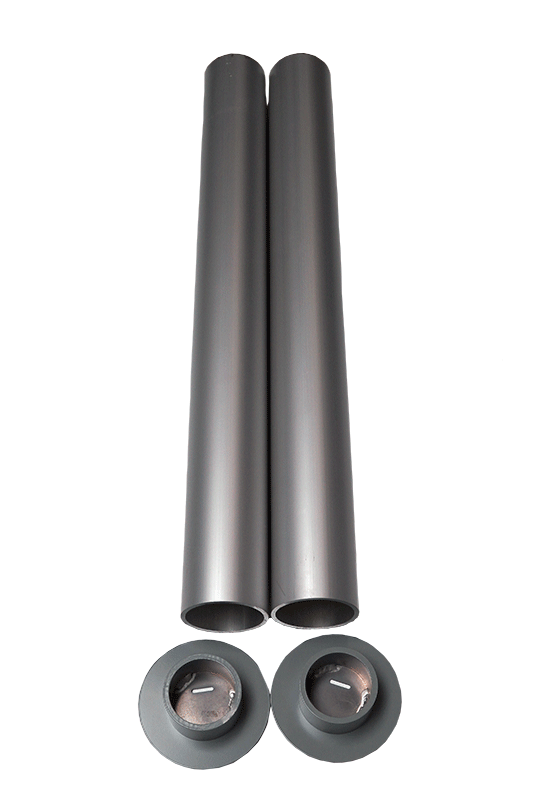 Edge Guard® - Designed to be installed on a treated 2 x 12 buried vertically one inch below grade with no cutting needed. We recommend having pieces overlapping every 8 feet for quick setup. 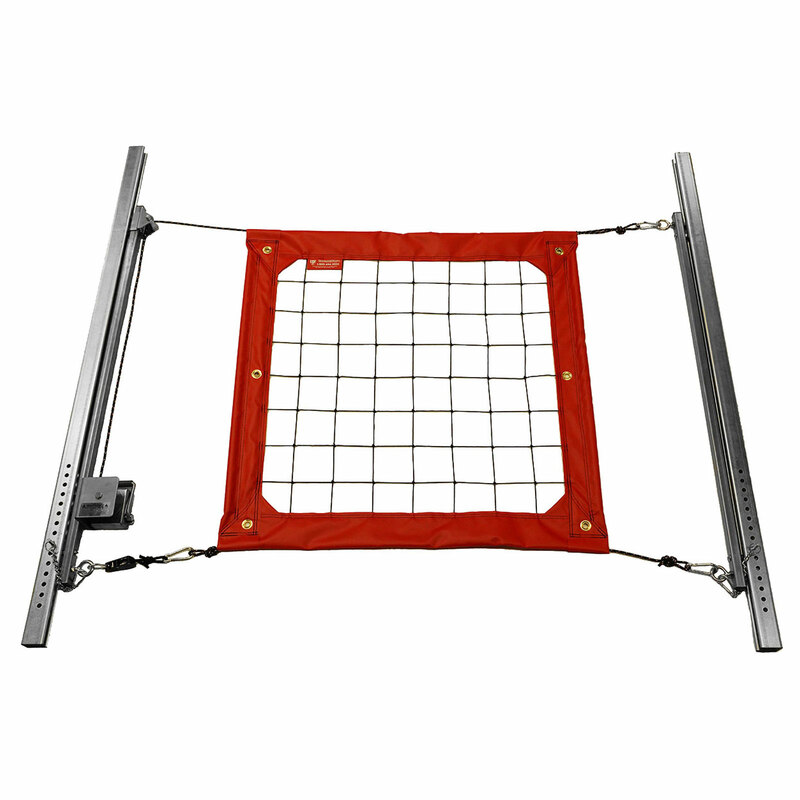 The Edge Guard® is then attached to the top of the board providing cushion if a player lands on top while being rigid enough to accept a weed wacker when maintaining the grass edge. This will also keep grass from growing into your sand. The material is made with Ultraviolet resistant plastic, helping its color last for years in outdoor exposure. Be sure to ask for color availability and pricing (1-800-494-3933). 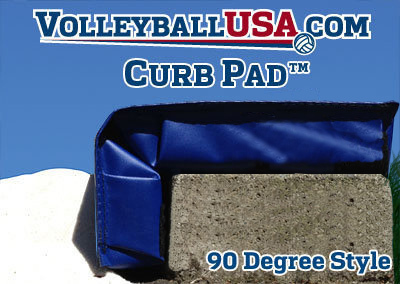 Curb Pad® - Designed to affix to the top of concrete or wood curbs wider than 2". This makes the inner and top edge of the material padded for protection while the outside edge facing the grass is left unpadded allowing maintenance for the grass. The Curb Pad® attaches easily to concrete curbs using rigid outdoor velcro but can be installed permanently via brass grommets. 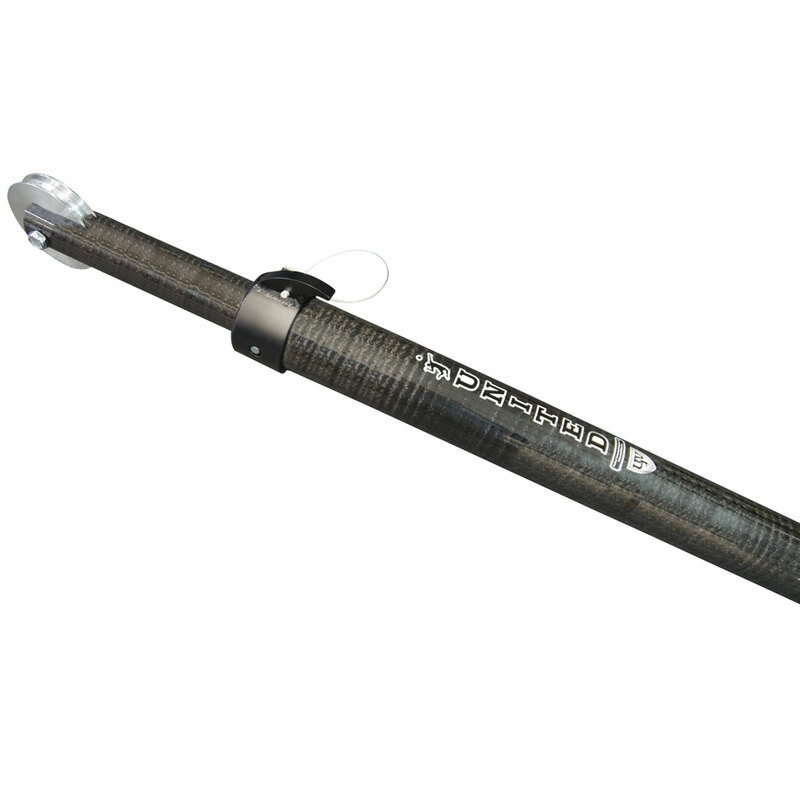 It is available in any length and also available in 1" - 4" high compression foam thickness. 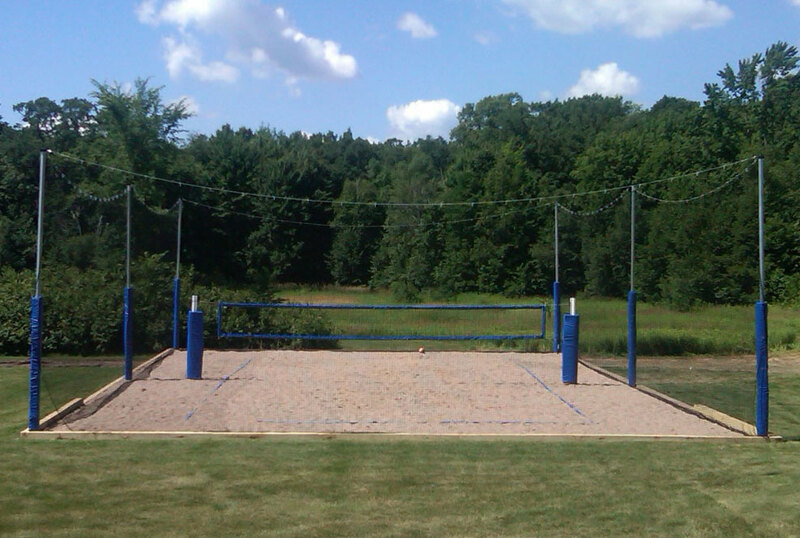 After excavation, drainage and court edging has been completed, you will be ready for your volleyball sand. 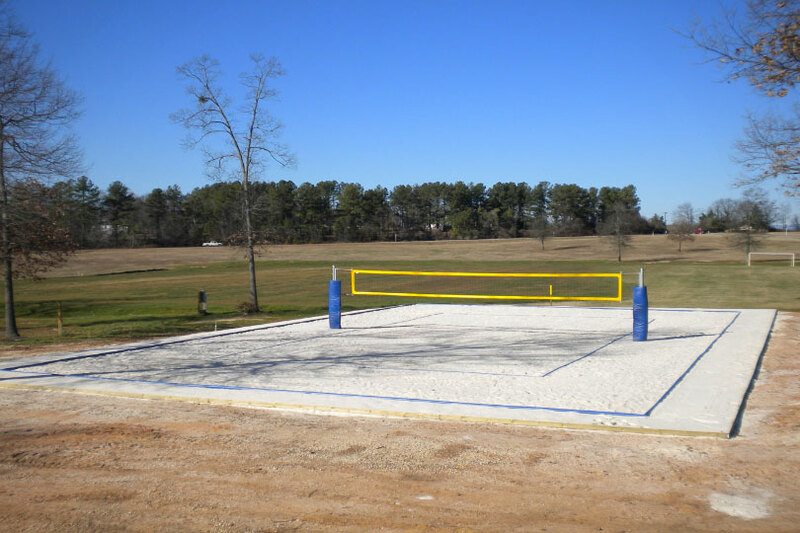 We enjoy the challenge of helping people select the best volleyball sand for each project we work on. 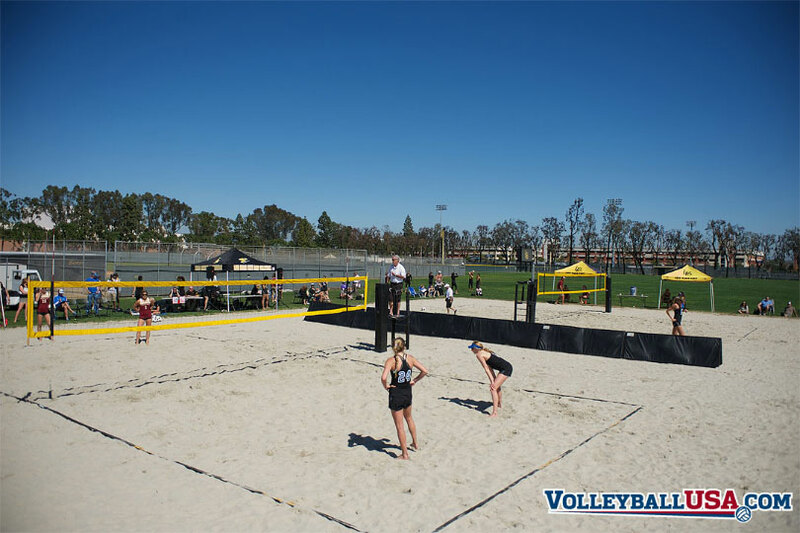 As the leader in beach volleyball court construction, we have thorough knowledge of what is good and bad sand for volleyball. 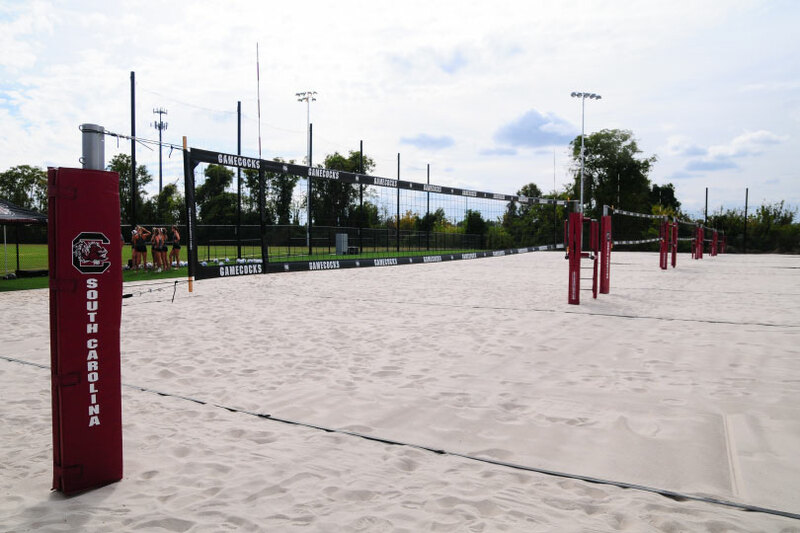 In the past, we have worked on countless projects where local sand and gravel companies have lead customers towards a sand they regretted purchasing as soon as people start playing volleyball on it. Sand and gravel companies are in business to sell sand and DO NOT offer a money back guarantee if you are unhappy with it for volleyball use. 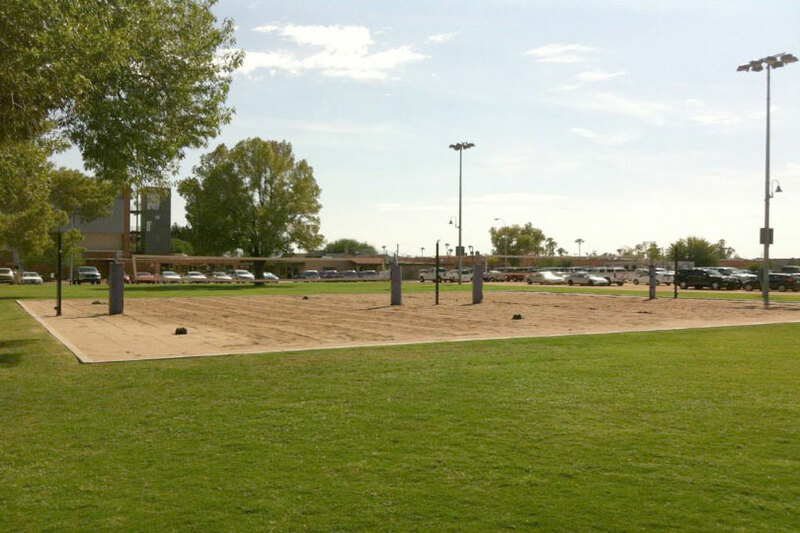 This is why we have invested thousands of dollars in time and equipment to determine what is good, low cost volleyball sand throughout the United States. Masonry sand is typically full of dust, little pebbles or both. 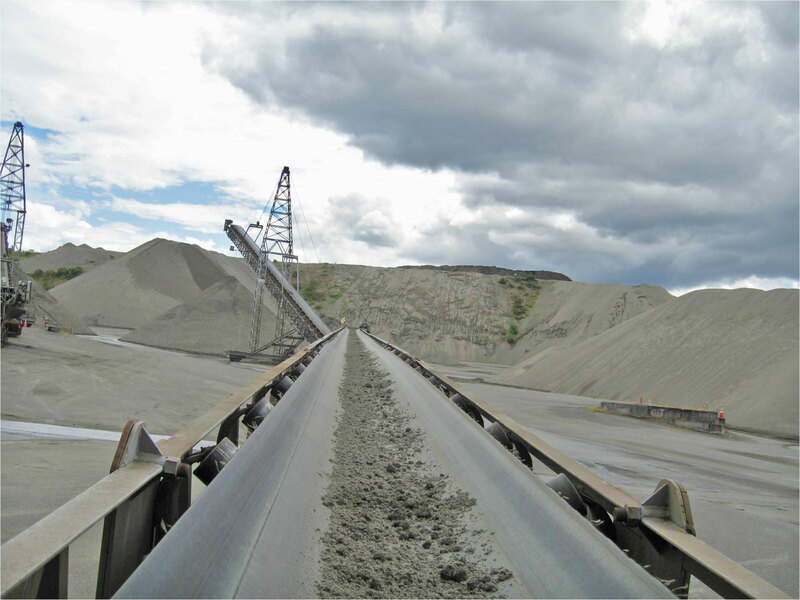 Masonry sand on average will typically have 3-5% dust in it with most companies screening out only 1/8" rocks or bigger. 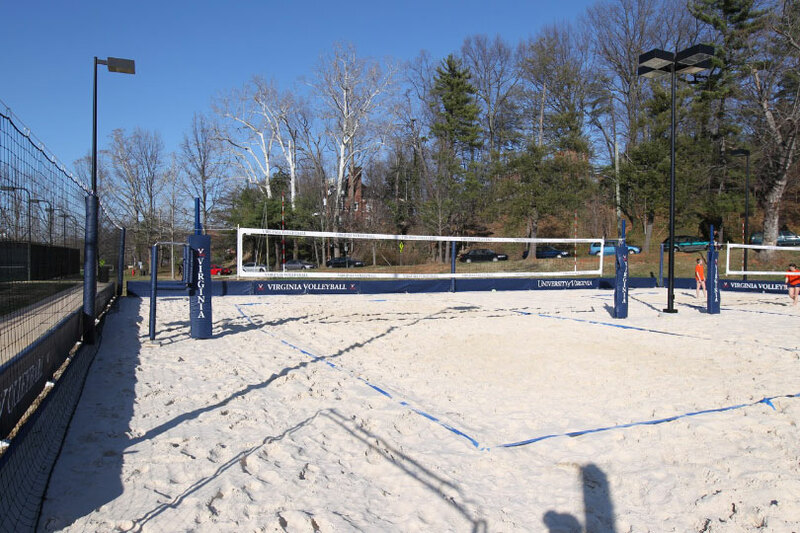 Many courts we've seen have been built with Masonry sand containing 10% pea gravel content! Courts built with this bad sand will be dusty, cut your feet, knees and elbows, and will pack often after rainfall. Finding sand without these three issues is not easy. We spend countless hours working on sourcing / blending / screening sand to meet volleyball criteria. We often do it to compliment the equipment we sell. Golf Bunker sand is made to pass the fried egg test with golf balls. 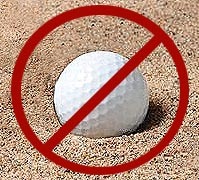 This means if a golf ball hits the sand only half the golf ball submerges in the sand. This is the exact opposite of what you want with beach volleyball sand. You want your knees, elbows and feet to sink in the soft sand. Applying the fried egg test to beach volleyball means substituting a golf ball for a knee cap or elbow and results in a scrape, bruise, bone contusion, dislocated shoulder, broken bone, etc.. Play Sand is designed to be sat in and played with by little kids and is sold at a lower price. To keep the price low they don't remove the dust. It has lots of dust that is very noticeable as soon as you put a bunch down and start playing volleyball. 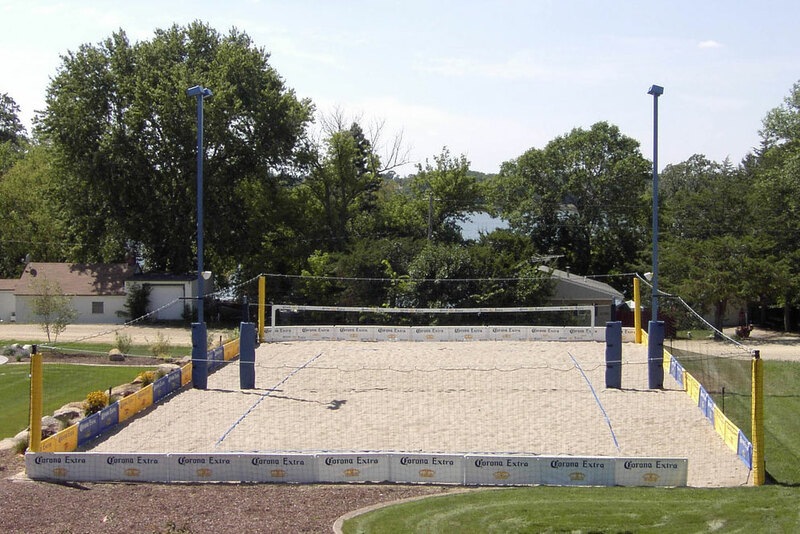 The reason we are the leader in the United States in volleyball sand sales... We take a different approach. 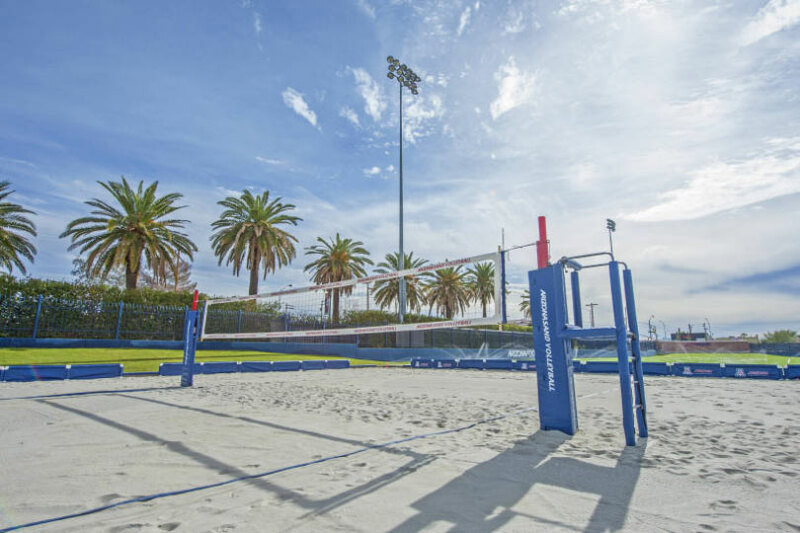 We start with sand currently in use at popular spots around the country like Manhattan Beach, Santa Barbara, Ft. Myers, Etc.. and make our volleyball sands in major metropolitan areas to closely match these beach sands just like Mother Nature did. 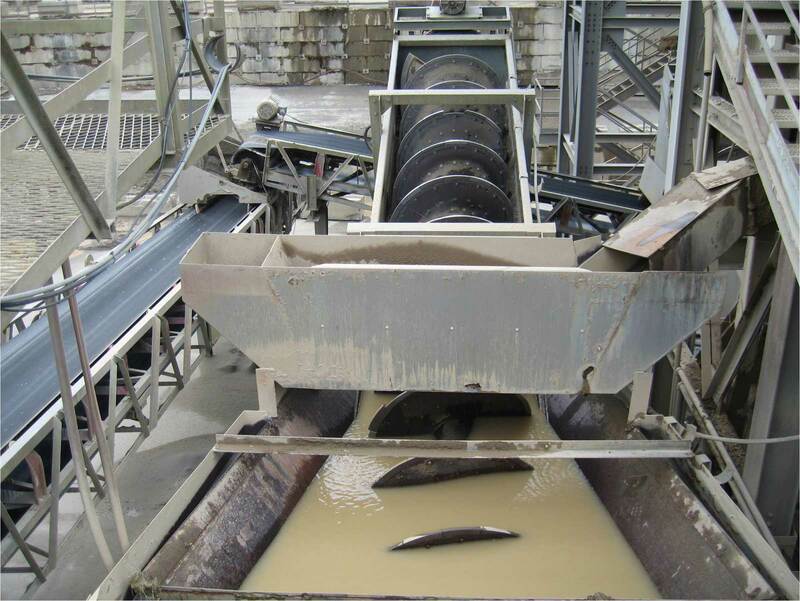 The cost is typically more than Masonry Sand since it costs money to pay people to hydraulically spin the dust out of the sand and to remove all of the small pebbles that scrape up your skin. 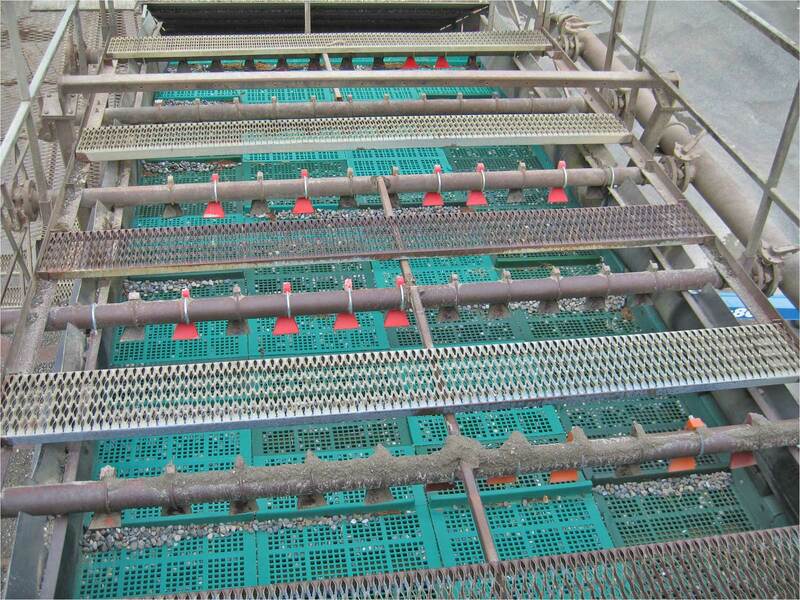 It takes sand plants a long time to mechanically screen out the small rocks and pebbles when making 200 tons of sand for a standard size volleyball court. 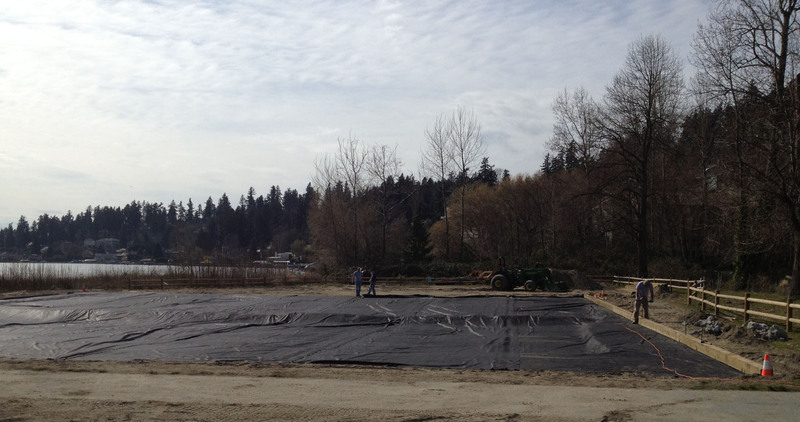 In most areas a homeowner cannot ask a sand plant to make volleyball sand. Sand companies do not want to stop production of their profitable sands to make a few hundred tons of volleyball sand. 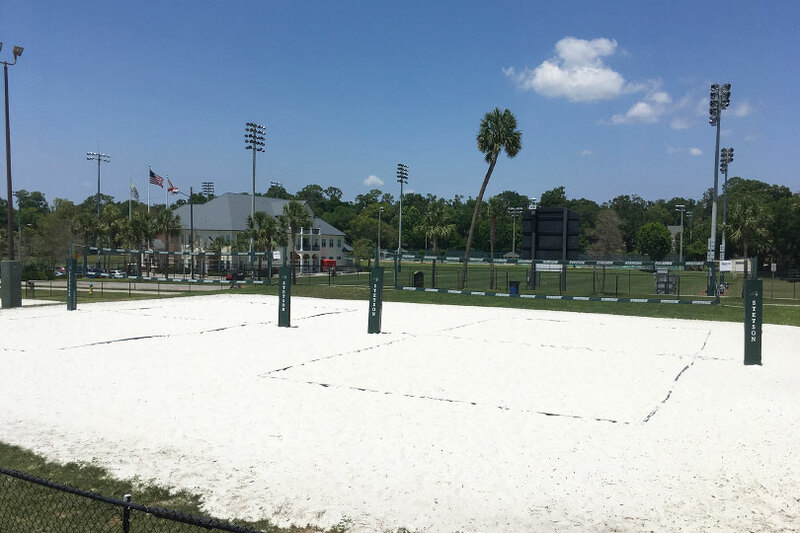 Since we build so many courts around the country we can pay them to do this process and in return re-sell the sand to the volleyball marketplace in need of this product. 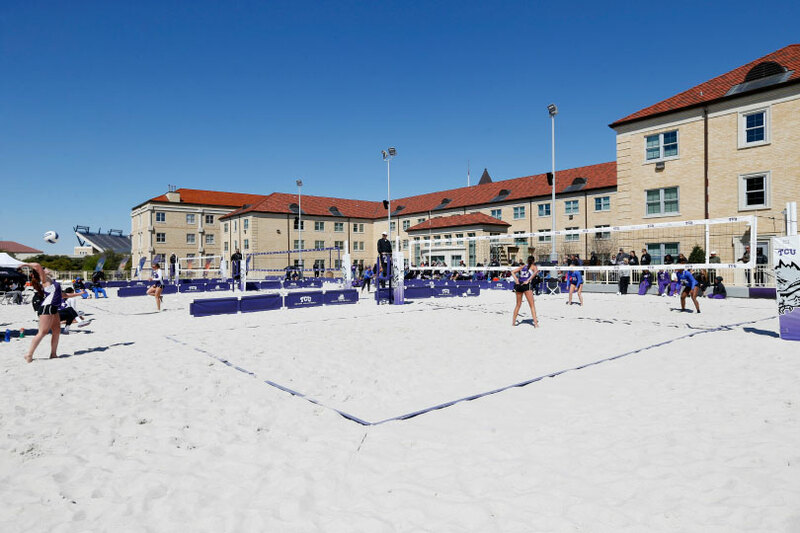 Your budget may dictate the depth of sand used but keep in mind that if you go with a lesser depth, you must plan on raking or shoveling back sand from the middle of your "dished out court" to the sides about once a week or more (depending on how often the court is used). Please enter your court dimensions for your estimated sand tonnage. Many colleges choose to install volleyball poles into sleeves to allow for storage during the winter or off-season. We offer two types. Both incorporate anodized aluminum to prevent rusting of the poles inside of the sleeves. Hard Surface Top Sleeve (left) -This sleeve is used on all non-floating floors and concreted in a 2 ft wide by 4 ft deep concrete footing re-enforced with re-bar. 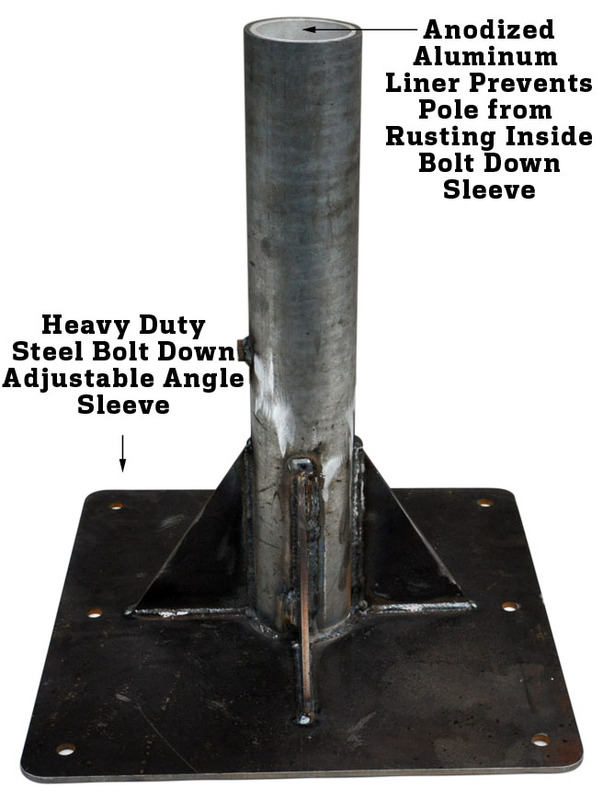 Bolt Down Sleeves (right) -Bolt down sleeves are designed to sit on-top of a submerged concrete footing also 2 foot by 4 foot wide. Six stainless steel j-bolts are installed to accept a steel bolt down plate with an anodized aluminum liner so that the finished pole angle can be adjusted with washers to accommodate the volleyball pole deflection. 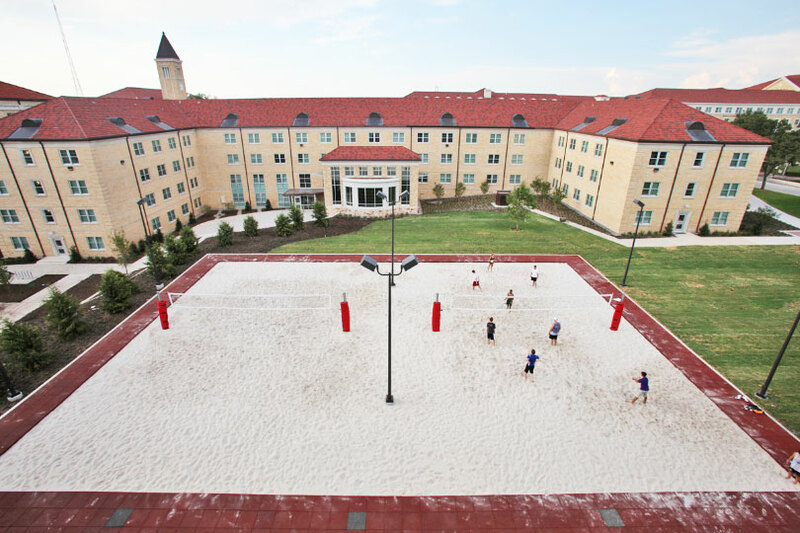 College volleyball facilities are currently built using poles in three styles. The first style being the use of telescoping poles similar to indoor volleyball poles but specialized for prolonged outdoor use, where the top cable comes off the top of the pole. The second style is working with existing equipment where hardware is purchased to update existing equipment to handle college level competition. 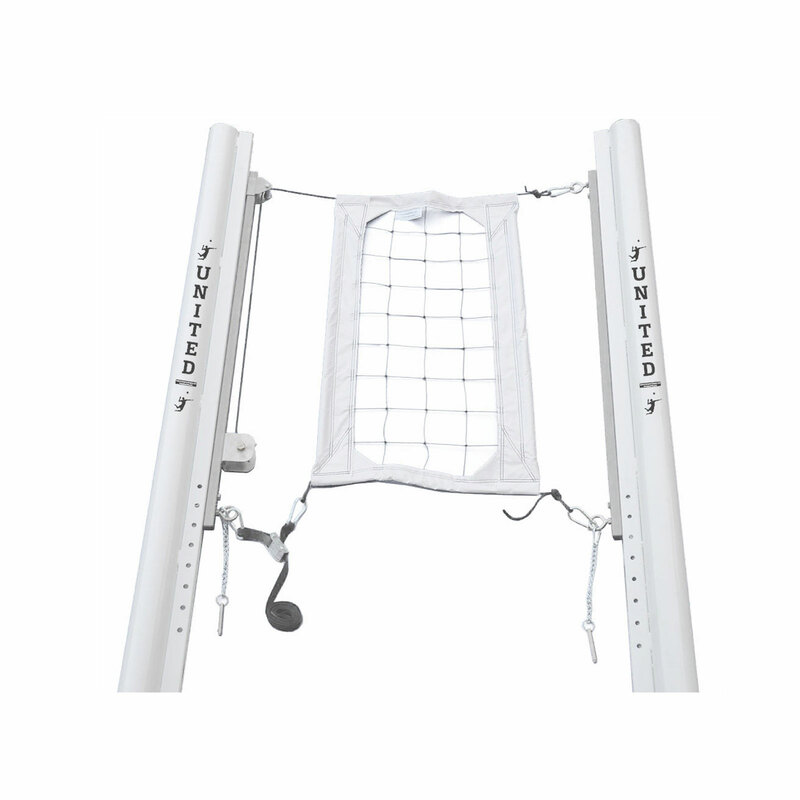 The third style utilizes a taller men's and women's compatible pole that can quickly and easily adjust from one height to another, accommodating more volleyball players at their school. We print and sew all of our volleyball nets. 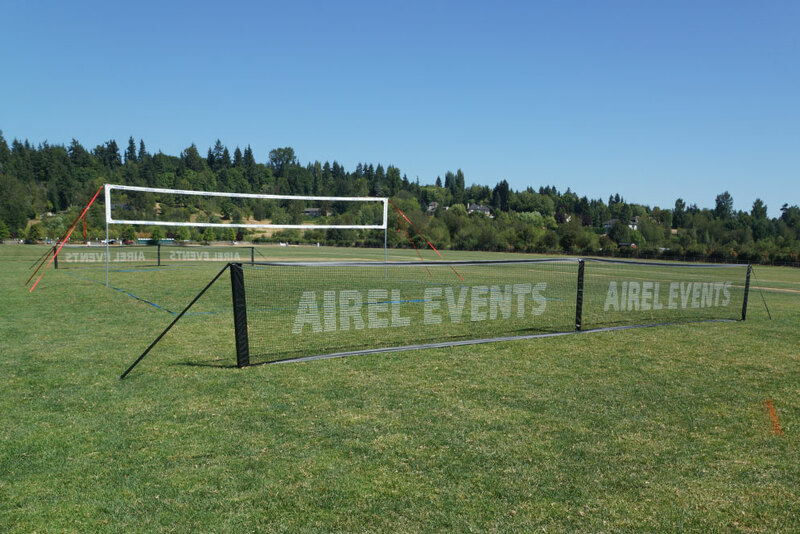 We pride ourselves on making the longest lasting volleyball nets in the world using the highest quality vinyls, strongest sewing thread, dowels and stainless steel cables. When investing money on custom printed volleyball nets your net is only as good as it's weakest component. The University of South Carolina net you see here (below) was made with a 5 year limited warranty using a 2 color screen print process. These can be challenging to make but the superior materials and printing process provide the outdoor longevity colleges are looking for. 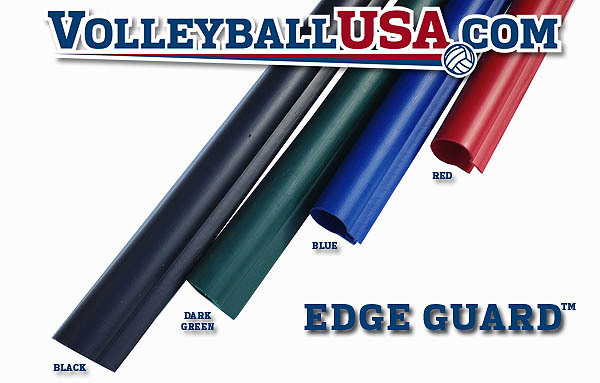 We manufacture a wide variety of volleyball pole pads ranging from casual / recreational style pads to professional styled pads with pre-formed corners. We use 2" high compression foam to a height of 6' in order to protect both smaller and taller players from injuries. Each pad uses 18 oz. vinyl that is both Ultraviolet and Mildew Resistant. There are 16 different colors we offer so we can do most major school colors. As shown below, we are capable of doing custom artwork on the padding, both digitally and screen printed. For printed pads, the color will last much longer and even withstand the elements in outdoor environments. With us manufacturing boundary lines, we make lines in pretty much any color at official court size or adjustable so your referees can fine tune the lines to an exact 26'3" x 52'6". The lines are held in place by sand plants buried in the sand on each corner, maintaining shape even if knicked by diving players. 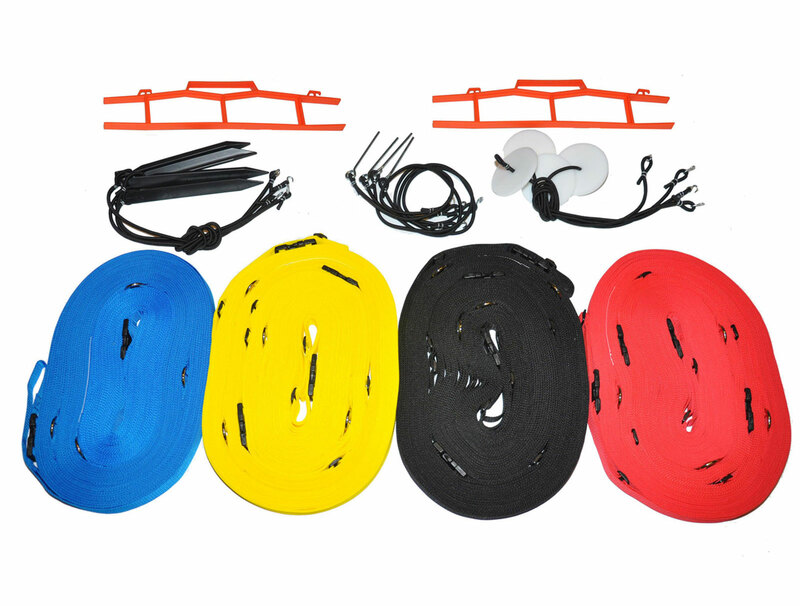 Pro adjustable Boundary Lines (left)- Used in professional volleyball tours and in the Olympic Games, these are made of heavy duty Ultraviolet treated webbing, preventing color fading in prolonged sunlight. Attached are adjustable buckles for fine tuning. Premium Boundary Lines (right)- Constructed out of two layers of 18 oz vinyl and 4 rows of stitching to eliminate stretching. 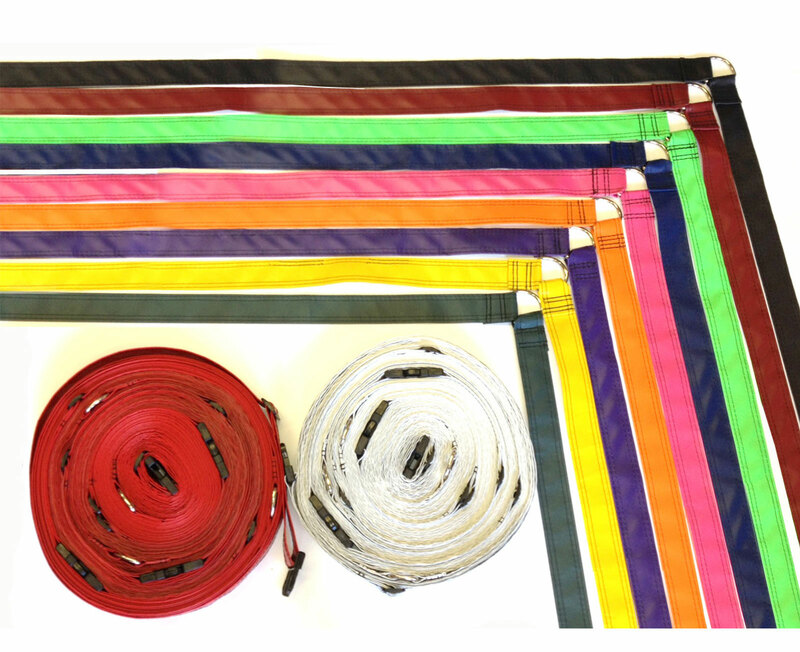 Other lines on the market typically use single layer / non sewn vinyl and tend to stretch. Like the Pro adjustable lines, these also have adjustable buckles. Offered in 16 different colors. 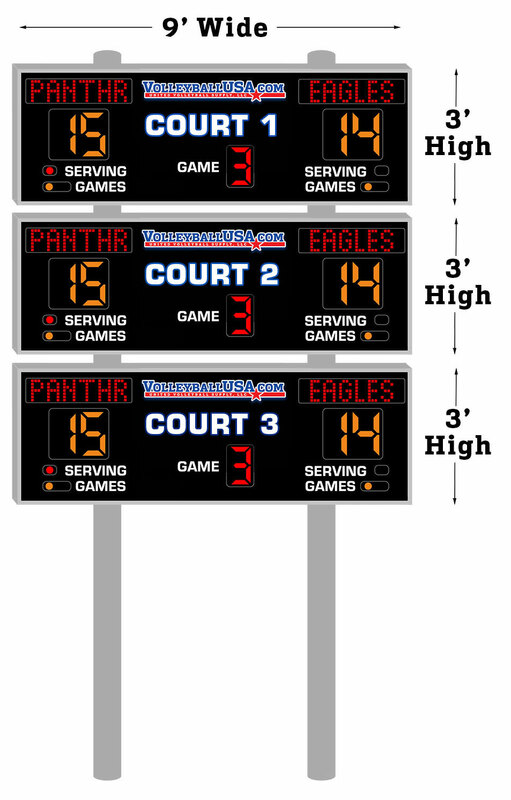 We have three different styles available for electronic scoreboards and they can be modified for specific school needs. 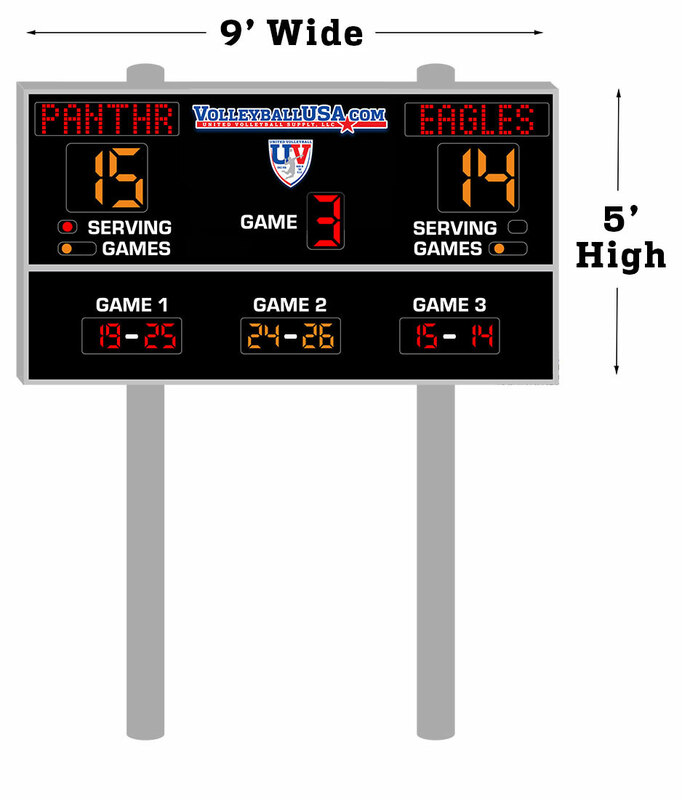 All are Permanent Outdoor Volleyball Scoreboards and come as Single Court, Multi-Court, and Single Court with Past Game Scoring. Each scoreboard is digital, allowing for scores, games, and team names to switch sides depending on teams position on the field. Digits are different heights. Score - 12", Current Game - 10", Past Game - 5", Indicators -2". Each scoreboard also includes a horn. 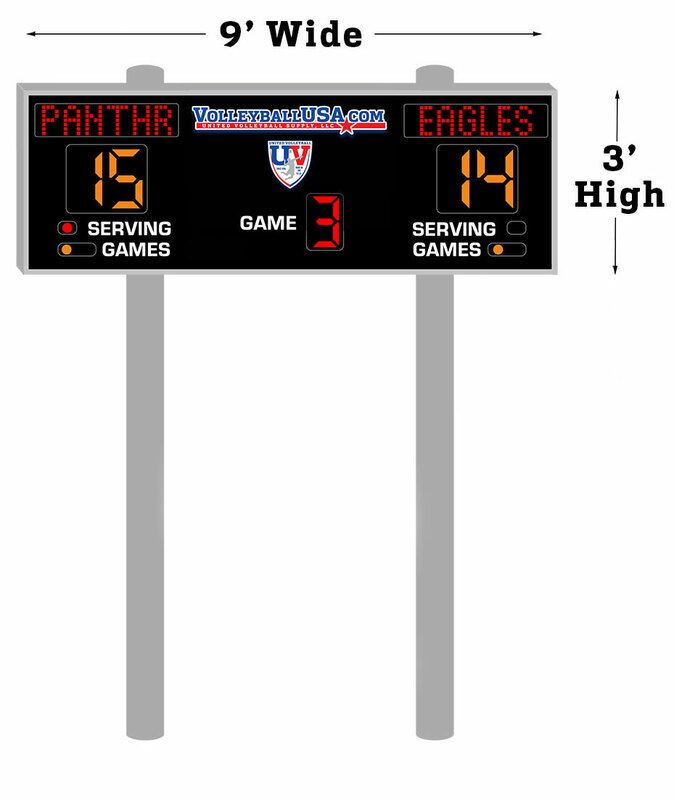 Pricing includes custom printing for school name and logo on the center of each scoreboard. 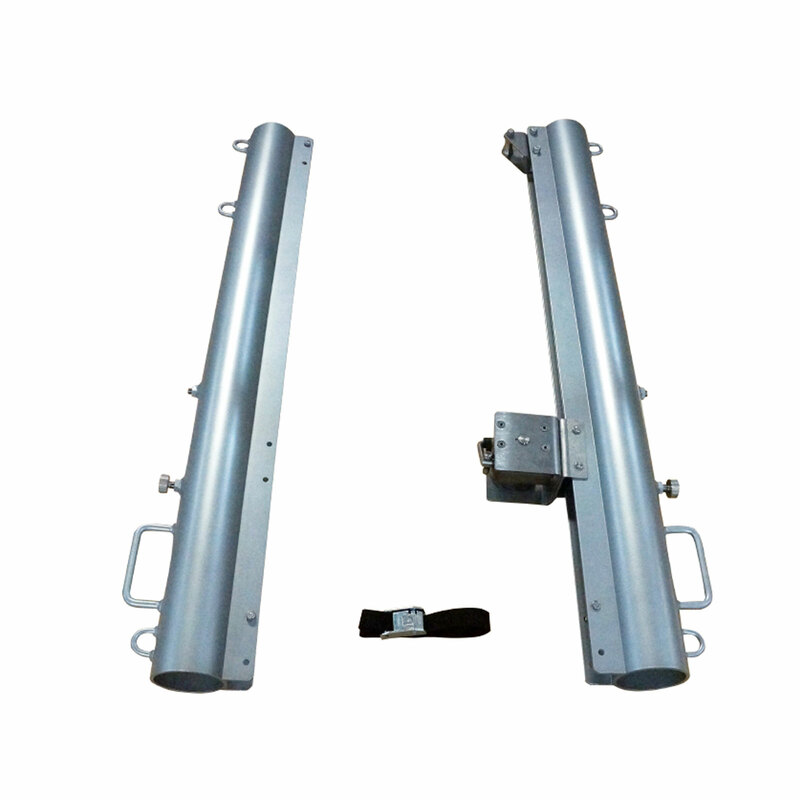 Optional mounting posts are available for extra cost Call 1-800-494-3933 for pricing. 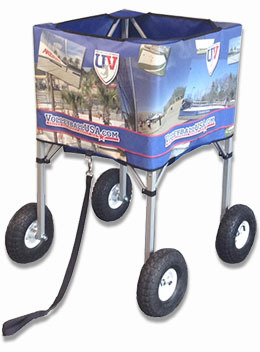 Made per the request of coaches who want a non-rusting, strong aluminum frame ball cart with wheels capable of rolling easily in the sand and grass." Wheels are designed to not swivel as our testing showed the swivel wheels in sand make the cart harder to pull and the non-swivel wheels easily displace the sand and go in the direction the cart is pulled. Not available in Hammock style as that design proved to be top heavy and prone to tip over when used in the sand. Carts typically ship in one color 18oz. vinyl available in Red, Royal Blue, Navy Blue, Light Blue, Black, Pink, Lime Green, Kelly Green, Dark Green, Maroon, Purple and Orange. Don't chase after volleyballs! Play twice as many games in the same amount of time because you don't have to play hit and fetch. This is a must have for commercial applications when trying to accomodate lots of players or when you oly have the space for one or a few courts. We manufacture all court enclosures and can make packages to fit your court needs. Browse our selection of court enclosures.